POTEAU, OKLAHOMA – The City of Poteau, Carl Albert State College, Classic Country 107.3 and the Poteau Chamber of Commerce are getting plans ready for the 2nd Annual Chili Cook Off. Friday, April 20th 11: -2:00 at The Donald W. Reynolds Center. 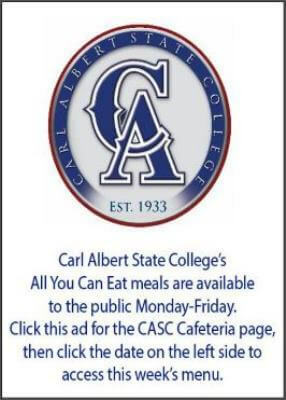 Carl Albert State College and The Poteau Chamber of Commerce have put together another great team that results in a great day for this event. Last year was the first time to host the event at The Donald W. Reynolds Center. The format was changed from the previous CASC Chili Cook Off and those that had teams and came out to eat loved the new format and larger venue at DWRCC. As last year’s event, each team will have an 8ft round table and could decorate, display and get crazy with ideas to draw the most attraction and votes. Team requirements are, each team must have a minimum of 5 crockpots of chili. If any one of the pots is chosen as the winner the team wins total prize of $300 in cash, a traveling trophy and bragging rights. Registration is FREE, and each registering team will receive 5 armbands for entrance to the event. Other prizes will be awarded include $200 for second place and $100 people’s choice for best costume and presentation. This is a great business networking event and most of all some great chili. This will expose the teams to all those that have purchased tickets to sample the great chili of Poteau and the River Valley. Classic Country 107.3 will be here helping with promotion and working with the crowds during the length of the event. Donald W. Reynolds Center will host the event in the large banquet room allowing everyone to be there at one time with lots seating space. Poteau Chamber will be serving hot-dogs chuck wagon style. Mark your calendar, get your teams ready and stay tuned for more information on our Facebook page Poteau Chili Cook Off. Proceeds of this event will benefit a local non-profit organization. Last year’s benefactor was The LeFlore County Youth Services. “We could not do this without our corporate partners Classic Country 107.3, Wal-Mart and Pepsi. These great businesses helped make this event a huge success allowing business to network with new people, make new friends and just have some fun for the day. 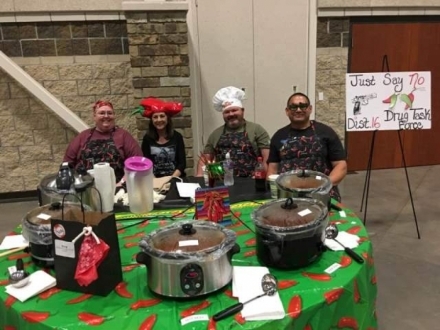 Poteau Chamber wants to see this grow into the largest Chili Cook-Off in the River Valley Area”, states Karen Wages CEO Poteau Chamber of Commerce. To sign up as a team visit our website www.poteauchamber.com or the Facebook page Poteau Chili Cook Off or contact Sara at the Chamber Office 918-647-9178. Deadline for Team Entry April 16th. To purchase tickets, call the Chamber Office. Tickets only $8 per person and will get a chance to win cash door prizes. Get your Chili Cooking or Tasting Skills on and join us on Friday, April 20th from 11:00 a.m. – 2:00 p.m.